These specialist bags attach to a cycle rack over the rear or front wheel of your bike to form a bicycle pannier rack. For anyone cycling a reasonable distance who needs to carry a change of clothes, lunch and maybe a few other items – panniers are the number one option. With the weight of your load balanced low on the bike, once you get going, you hardly notice its there. 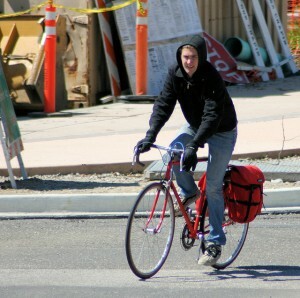 Over long distances you will really appreciate how much less tiring it is than riding with a bag on your back. Plus, with nothing weighing you down riding is more comfortable and less sweaty. It’s possible to squash quite a lot of stuff into a set of two bicycle panniers, so there will be room for a mini-pump and a few tools as well as all your work stuff. Many good quality panniers are designed to be completely waterproof, with a watertight seal, so you can rely on them to keep your kit dry. Panniers are probably the most expensive kind of bag you can buy for your bike but a good quality set can easily last you a decade. Also, if you haven’t already got one, you’ll have to buy a rack to go on the back of your bike for them to hang off. The extra weight on the bike can make your bike less maneuvrerable at slow speeds but it doesn’t take long to get used to. However, it’s not so easy to get your things in and out of a pannier, so they are not suited to those taking things in and out all the time. Neither are they best for those who are getting on and off to visit several destinations – like a cycle courier – as when you leave your bike you have to take your pannier with you. These bags are designed to be hung on your bike, not carried around, so they are not as easy to carry about as a rucksack. Nevertheless, many modern designs have a handy shoulder strap which makes carrying them around much easier. As soon as it’s more than a shower, a fully waterproof pannier is essential. Who wants to change into damp clothes at work! Make sure you get a waterproofed pannier with a roll-top to keep moisture out. As a pannier won’t be touching your body like a rucksack you don’t have to worry about the material breathing. Invest in a model with a shoulder strap as there will be situations when you need to carry them off the bike. An extra few quid will save you years of grumpiness.